The Prep School had a Commitment Lesson earlier this week. Seven of the Preppies were given the opportunity to stand up in the front of the theater and talk about what commitment meant to them. What does commitment mean to you? At the beginning of the Lesson they were asked if any of them felt like they were going to get into the Academy and graduate from the Academy. Were they committed? Did they know what being committed meant to them? C/C Zhukov was the first one who spoke and during his speech he mentioned a quote. "There is not talent here. This is hard work, this is an obsession. Talent does not exist; we are all equal as human beings. You can be anyone if you put in the time, you will reach the top and that’s that. I am not talented – I am obsessed.” He talked about how when he first got to the Prep School, he wasn't committed - but once he pushed through the negative thoughts he had about going through BMT and being here he started to realize that there was something bigger than what he was dealing with. "In the future what kind of places can I go, what kind of people can I help?" He thought to himself. There are so many opportunities that the Air Force can provide him as an officer, all of the opportunities that the Air Force has already provided him. He's made the commitment, to school and to the Air Force. To what his learning will provide him in the future. C/C Santos started by saying, "I got up at 5:50am. Laid in bed staring at the ceiling like – we’re in blues, it’s 16 degrees outside... 5:55am I have to get up – I committed myself to this and it’s because everybody here has made commitments or has continued to make commitments – Like I’m going to do better on this GR, I’m going to play better in my sport, I’m going to not complain about wearing blues today. These commitments shape how you think, how you sound, and how you act. Once you create a commitment - it will shape how you do everything. It gives you a script on how you need to handle things in life whether it is negative or positive." She made the commitment to go into the Military when she was in middle school but during that time her father was dealing with PTSD and then cancer and she was told many times how she wouldn’t make it in the Military. Those moments did not define her or make her commitment and less important. She said, “You have to find the good things even with all the stress that you’re under. You have to find your niche; you have to find something that you are willing to stay here for. To serve your country, and get a great education. To try something that you know the majority of Americans will not be able to try. That is what life is about. Next time you are going through something you feel like you can’t handle think about this quote." “A moment of pain is worth a lifetime of glory." In High School C/C Locke played every sport he could – never really having a summer break because he would be training for football for the fall season. One year, he said he was told by his basketball coach that he needed to choose between the two sports he was playing. The coach was trying to make him decide but he didn’t want to have to choose, he wasn't a quitter. He decided to make the coach have to kick him off the team, but the coach never did. So he sat the bench for most of the season but during the last 3 to 4 games he was given the opportunity to play. Through it all he stood by his decision to not quit. He ended up applying late to the Academy; people doubted him and said he was wasting his time. It pushed him harder to get the nominations and everything else he needed to. He finished his speech with "Don’t give up focus; there is a light at the end of this tunnel." C/C Dargle "My idea of commitment is something physical. Before you enlist into the air force you are in a The Delayed Entry Program ((DEP), also called the Delayed Enlistment Program) so you sit around waiting to go to basic training. For the air force fitness test you have to do a mile and a half run." He said, "While waiting to go to basic training, I would get together with other individuals waiting as well and they would train together." He couldn’t even finish a mile part let alone the mile and a half when he started. This was back in 2013 and he had 3-4 months before going to basic training. He went on YouTube and looked up motivational videos. On one of the videos someone was doing a triathlon. He made it his goal that year to complete a triathlon; he went through basic training and then school - unfortunately because of the training and academics that year he wasn’t able to make this goal happen. But in 2014 he signed up for the Half Iron Man and with proper training he was able to complete it. It taught him a huge example especially translating into real life here and while in the Enlisted Air Force, sometimes to be committed you have to dive in completely and give it your all or else you’re not going to complete it. In 2010 C/C Kornblatt earned his Black Belt in Taekwondo. So far it has been one of his greatest achievements. He said, "In 2007 my dad decided that we would both start taking Taekwondo lessons. When I got there the first day, I noticed there was a board on one of the walls and on the board there was a word written and every week it would change... Respect. Perseverance. Commitment. Self-Control. Taekwondo isn’t just about learning how to kick, or how to fight. It’s a journey." Over the course of 3 and a half years he pushed himself through adversity after adversity and he found as he kept on going that he had this great opportunity. "All it takes is the time. The time and the commitment." He went on to say, "To earn your Black Belt you have to go through a fitness test. Two hours of a grueling beat down, pretty comparable of our Prep Basic Training. If you make it to the end you get your Black Belt. But it’s not just that, once you get your Black Belt – what next? You must have your goal in mind." His goal wasn’t to just get this Black Belt, it was to learn. He set his goal and he committed himself to getting there. He committed himself to giving his all. He is now able to do all of these different things because of Taekwondo and said what a privilege it’s been to be able to. "Whatever you set your mind to you can do it, so long as you are willing to commit." C/C Nimmo said he always had trouble making decisions. Joining the Air Force was a spur of the moment decision. He enlisted without telling his parents and two weeks before he left he finally told them. "When I was going through Field Training... There was a Lieutenant fresh out of college leading the team but one of the biggest problems with him was that he didn’t want to listen to anyone. Since he was the Officer, he was in charge. On the last night of Field Training, we had to do movements – tap movements, being quiet and avoiding the “enemy” in the training exercise. The Lieutenant wanted to go straight through the forest, but the group disagreed. We felt that with that route - we would get ambushed. But since the Lieutenant was in charge, he had the final say. Sure enough the Lieutenant made us go straight ahead and we got ambushed and no one survived the training exercise. The team got chewed out on the way back because of how their team did. What hit me the most with this exercise was that all it took was one Officer, one person to hypothetically take the whole team out because he wasn’t willing to work with the team." With that, he decided he wanted to become an Officer. He said, "I want to be able to listen to my Enlisted, to listen to the people around me. My ideas might not always be the right ideas but thinking of everyone else’s lives. I can take more things into consideration make the right decision and hopefully save lives. Going to the Prep School, to the Air Force Academy is the best way for me to become an Officer. I've got teachers here who actually care about me." When he first got into the Prep School, he said to himself. “Why am I here, why do I want to be here? I could be back in my Enlisted Unit doing my job. Then I realized - I’m committed, there’s no other choice. This is what I want to do. I don’t have to question anything because I know in my heart that I want to be a Lieutenant and that I want to lead people. So any time it’s tough, or I've got a ridiculous amount of school work, or wearing blues when it’s insanely cold. I'll think to myself, this is going to be the end all be all, this is how I’m going to get to my end goal. This is how I’m going to get to be a Lieutenant, so yes I’m going to freeze sometimes in my uniform, sometimes I’m going to have to do a lot of homework. But at the same time this is how I’m going to be able to lead people. Make a difference in my life. That’s what I want to do. That’s what I’m committed to." C/C Crotts "I want you to think back to Basic, one particular part. When I try to think of commitment and how we came together as a class there is one memory that sticks out. When we were all getting destroyed behind the church. I remember clapping at least 700 times. I remember looking around and seeing all of your faces, that day – it was awful. But at the same time there were a lot of people smiling. I know how we started off today with who is committed to being here and who thinks they are going to graduate. I would argue that the ones who stayed seated are committed to being here because they suffered through those things. When you were going through that in your head, was it the hardest thing you were going through at that time, was in the hardest thing in your life that you had to suffer through? Now we’re in a different phase, now we’re going through school, we have to manage our grades, we have to keep our uniforms clean, we have to clean our rooms, and I have to fold my bed a certain type of way. It’s a new struggle for me – I haven’t been in High School in over five years so for me sitting in class - I feel like I’m having to relearn everything all over again. But then I see you guys and for me commitment... The thing that I’m committed to is being a good leader and I know that sounds really cliché but I’ve had both sides of that coin. I’ve had a terrible leader and I’ve had a really awesome leader. The Commander I had at my last base has been the best leader I’ve ever had, he is my role model. The type of leader that I strive to be. If something is not okay with me, I am very direct, I will address it right there on the spot. But I’ve also had that leader that just yells. He doesn’t listen. He beats you down. But you see those types of things and I see you guys and I want to be the good leader. You are what get me through the hard times.... 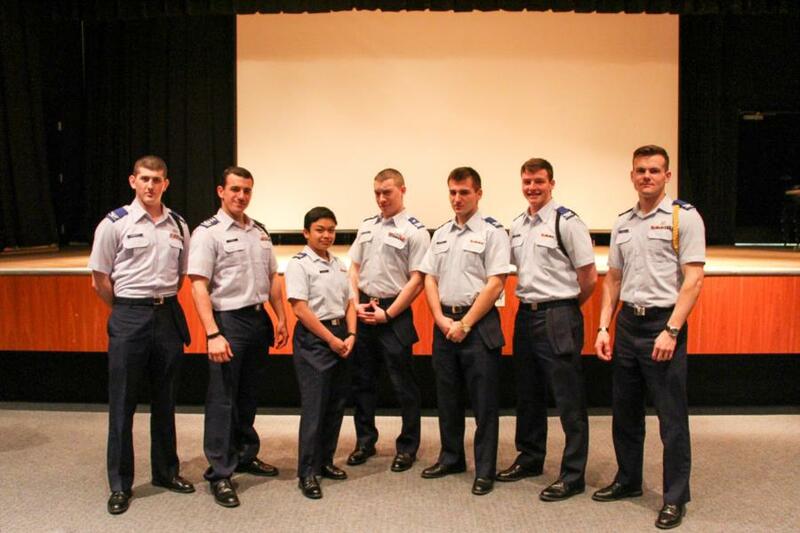 I think you are going to keep going and be the officer that as an Airman - I would want to represent me in front of the Commander. That is what you are going to be - the spokesperson for the Airmen. I came from a small town in Maryland. No one really had a high expectation for me. In middle school I said I was going to join the Air Force, I had family who were in the Navy and they always said that if they had the chance to do it again they would go into the Air Force instead. I committed myself to that I said this is what I want, so many people told me no. I would argue to you for the people that give you a reason to say no in your heads to challenge them. Challenge them in your heads or out loud. Who is anyone to stop you from getting where you want to go, who is any person to stand in your way? Keep moving forward. Don’t stop, what reason do you have to stop? The easiest way to fail is to not try. It’s all about what you define as success and what you have pushing you forward." After they were all done speaking with the group they watched a video on the motivation to being comitted. With whatever you are doing in your life, are you committed? What does commitment mean to you? To view the rest of the pictures taken from the event go to Classes - Prep School - Military Training. Or click the link below.